My homeboys at VANEATS.ca have partnered up with Whet Kitchen & Bar on Granville Island to bring you another sensational dining package affectionately known as “Whet Your Appetite”. It’s a 4 item adventure with a choice of mains and 2 sleeves of tasty Russell Angry Scotch Ale made right here in the GVRD (Surrey to be specific). At only $30 it’s a great deal so guys, quit being so cheap and take your significant other on a nice date! 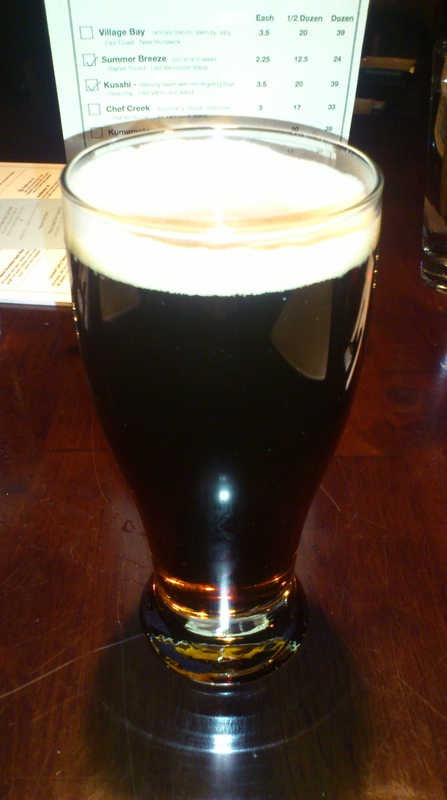 The Russell Angry Scotch Ale is always a treat. It’s a full bodied dark ale with a 6.5% kick that hits me right in my happy place. It’s also a great choice when the weather turns decidedly Vancouver-esque, meaning cloudy, wet and not particularly warm. 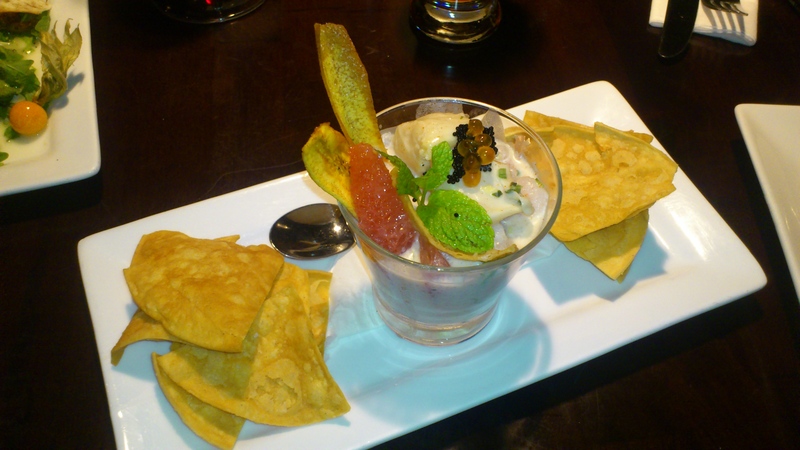 The first dish I tried was a very nice Coconut Scallop Ceviche. The scallops were large and in charge, the hand peeled shrimp were plentiful and the coconut added some sweetness to the citrus base of the liquid along with a subtle jalapeño punch. There’s two kinds of roe on top, Ikura and Tobiko, which are always a treat and went really well with this dish. The thick corn chips made a nice vessel to deliver the ceviche to your mouth but the chip to dip ratio was a little off, a fairly common problem, too many chips. Next up was a super tasty Prawn, Shrimp and Wild Mushroom Salad. 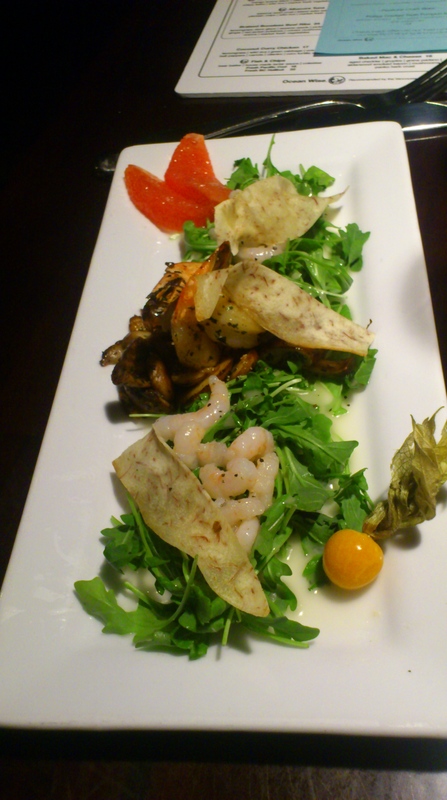 Made up of pan seared prawns, wild local mushrooms, hand peeled cold water shrimp, arugula, grapefruit, taro root crisps. Dressed in a delicious lemon-hazelnut vinaigrette this dish was a hit. The prawns were seasoned well and cooked just right, the wild mushrooms were warm and paired well with the peppery arugula. The vinaigrette was a nice combo of sweet and savoury. I had both main courses, for journalistic purposes… I added the second main at a cost of $15. 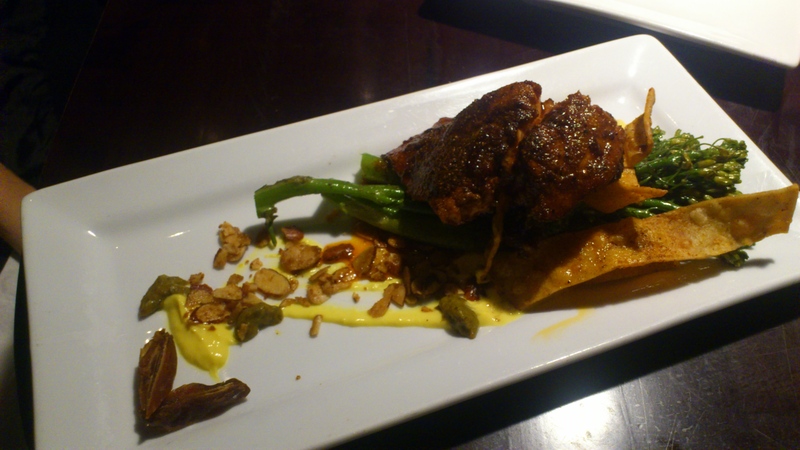 First up I had the Red Honey-Curry Coho, wild BC Coho, saffron yoghurt, hot pickled lime puree, candied almonds, cinnamon market vegetable (which was Broccolini). This dish is pretty incredible, the coho is amazing, all of the spices work together very well and the saffron yoghurt adds a creamy exotic note that paired fantastically with the flavourful salmon. 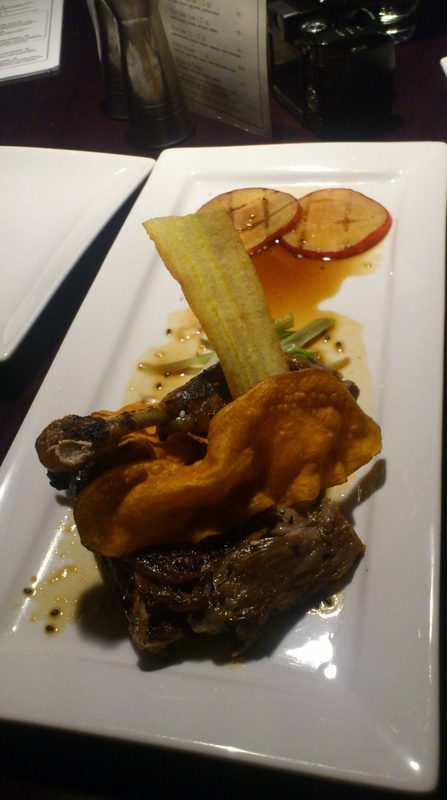 The other main course choice is Crispy Duck Leg, confit of Fraser Valley duck leg, sweet chill ginger sauce, yam & plantain chips, sesame seeds and grilled plums. The duck was spot on, very moist and tender with nice crispy skin. Crispy duck skin is the bacon of the avian world, so good. The big surprise for me was how much I liked the grilled plums, I could’ve eaten a whole plate of them. I wasn’t dining alone on this adventure so when our meals were done we decided to add on a couple of desserts. 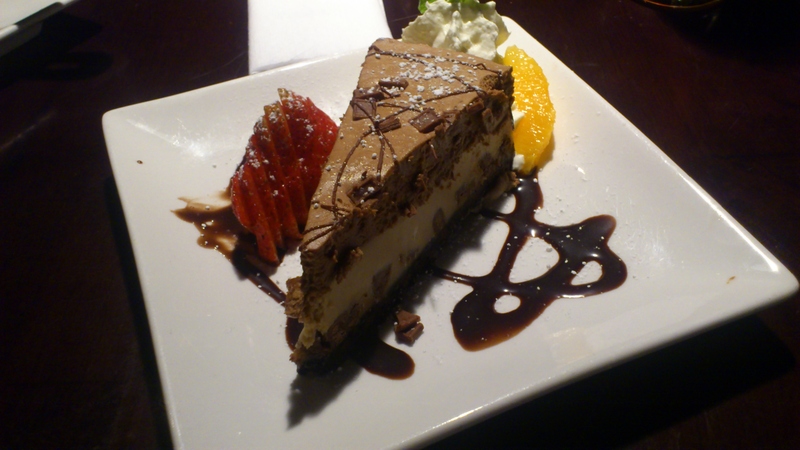 The Chocolate chunk cheesecake was great but there is a dessert at Whet that you can’t leave without ordering. 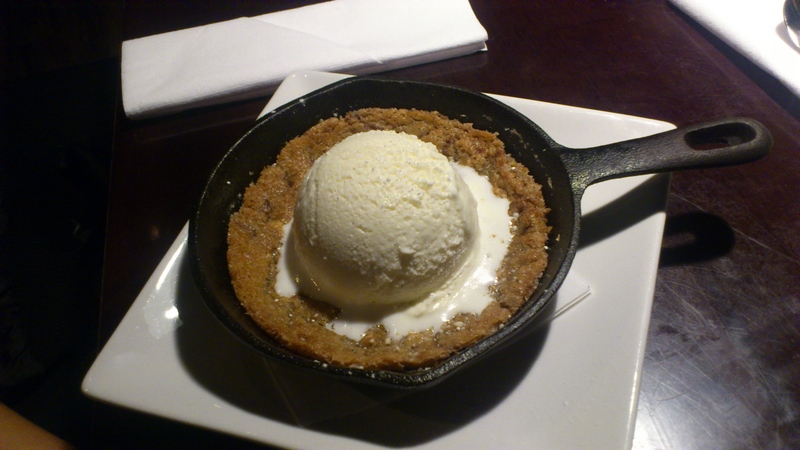 It’s a chocolate chip cookie baked in a small cast iron pan, served warm in said pan with a scoop of vanilla ice cream on top. It’s so simple yet amazingly good. Cheers to the team at Whet and the crew at VANEATS.ca for putting together a winner here, great taste, great location and outstanding value. My meal was provided free of charge for review purposes but, as always, if it was gross I would’ve said so. Get down to Granville Island and Whet Your Appetite!! My extra main and desserts were over and above the cost of the package but I would recommend adding the cookie… amazing. Movember 2012, join team WFLBC! Thanks for a great review! “Bacon of the avian world” – nice touch.